Last year, after basking in the glow of opening a zillion presents, we decided as a family (or my mom and I did... not sure about my brother) that we didn't need zillions of presents anymore. Presents are great and all, but we're all at an age that it's quality over quantity. 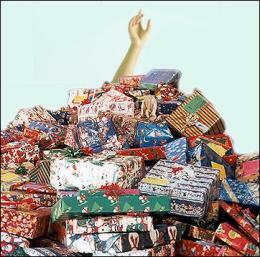 We'd all rather get one good gift, and some stocking stuffers, than get lost in a pile of stuff. Seriously. I don't think that the number of presents under the tree had gone down in numbers since I was a kid, even though I'm obviously older, buy most of the stuff I want myself and my stuff I do ask for is more expensive. Last year my mom made a Christmas hamper for one of the local organizations back home. It is one of the better organizations in the fact that they give you a list of stuff - everything from stuff for a Christmas meal, to some day-to-day necessities like peanut butter and flour, rather than you just throwing all of the food you don't want into a box, and expect another family to like it. I mean - how many cans of smoked oysters and boxes of jello do families in need really want? So, we decided that that's what we would do this year - instead of buying tonnes of stuff for eachother, that we may or may not need, that we'd pick a service group and donate our money/time to them. My mom is still doing a hamper. It's a little harder for me to do that here, as a) I can't find an organization that is as organized as the one back home and b) I can't really find an organization that isn't tied to a church (I'd rather be non-secular with my donations... yes, I know it Christmas, but that's just a decision I've made). So, I'll be pulling names off of a Christmas tree and buying presents to be wrapped and given to kids in the city. The tree has little tags on it with information like "Girl, age 5" and "Boy, age 7" on them. I'm going to go and grab a few tags and go shopping. I figure with my excellent ability to buy cool things on sale, that I'll be able to get six or so kids a decent gift for about $100. I've also limited the gifts that I buy for my "nieces" and "nephews". Gone are the days when Auntie Carmen would show up with a carload of gifts. This year, I'm striving to be more reasonable in my gift giving, and not just keep buying cause things are a deal. That is, unless I can wrap that gift up for "Girl, age 6". My family has cut back on the amount of gifts too, although I can't say that we give to charity all that much. My mom's work does, and she does through that. We used to wake up to gifts piling out of the living room and into the kitchen, not it's just a few really needed or loved items. My list so far has three items, where as when I was a kid, there had to be close to 15 random things.